Now, as you might have guessed already to add configurable products into bundles you will need an extension for Magento 2. In this article we will talk about Improved Configurable Product extension developed and supported by FireBear Studio that can do the topic. Improved Configurable Product is a Magento 2 extension, fully operation from the administrator panel (backend). 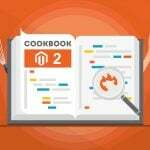 Every possible configuration option can be found either in the Stores > Configuration section, or at the configurable product details page of your Magento 2 backend. Dynamic update of the product and category pages depending on the configurable variations customers select. It means that page URL, product name, SKU and descriptions are updated automatically with AJAX whenever the customer selects a variation of choice. Custom options for configurable products. To further enhance the performance and variability of the configurable products, you can now add custom options to it and to the child simple products (only optional custom options can be displayed in the Product Matrix). Configurable product matrix view. Allows customers to select multiple variation and add them to the cart simultaneously saving much of the shopping time for huge stores. Full tier price support for configurable product matrix view. Tier prices of the variations are displayed inside the matrix grid. Matrix view eliminates several steps when adding multiple configurable product variations to the cart, making the shopping experience even better. Custom flexible price range display. You can define how you want to price range and default price block displayed. Dedicated URLs for variations. Select configurable product variation, copy the product URL. You can now paste the URL to configurable product with relevant variation selected. Use it for advertising or precise management. 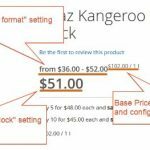 Custom product page layout allows to you arrange different blocks of your custom Magento 2 theme seamlessly to fit every Improved Configurable Product feature. Metadata and schema.org dynamic updates can improve your SEO, when it comes to unique values of the configurable variations. Now that we have got acquainted with the extension and what it does, let’s see how can it help you add configurable products into bundles. 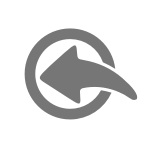 Step 1 – install Improved Configurable Product extension. 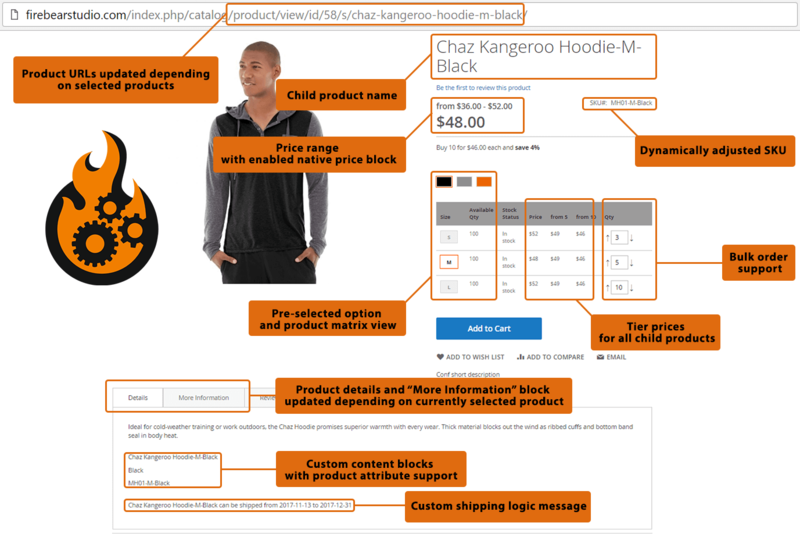 Step 2 – create Magento 2 bundle product. 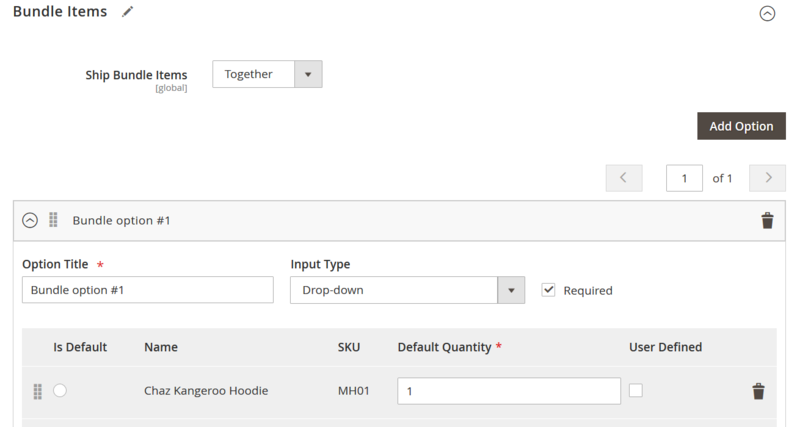 Step 3 – add configurable products to Magento 2 bundle products. That’s it actually. To nail down the steps here is an instruction with the screenshots. Before we proceed – make sure you have installed Improved Configurable Products. Then, log in to your Magento 2 administrator panel and navigate to Catalog > Products and create new bundle product. When at the product details page, fill in all the general settings such as name, and other attributes you use and scroll down to Bundle Items section. Here, as with other bundle products, you click ‘Add Option’ button and in the product grid select configurable products. When you will as many options as you like, you save bundle product. That’s it. Now you can check the bundle product at the frontend. 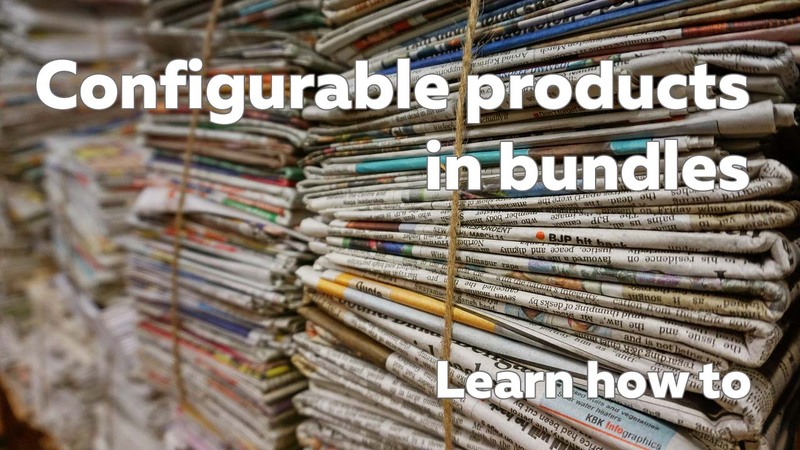 Here is how the bundle product with configurable products assigned will work at your Magento 2 frontend. This is pretty much it. 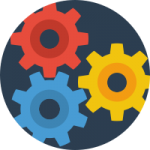 If you still have any questions on how Improved Configurable Products extension works, or require detailed instructions – read Improved Configurable Product manual.